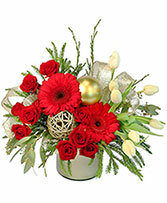 A starry night on Christmas Eve inspired ornament full of beautiful red roses, white cushions, and red carnations. 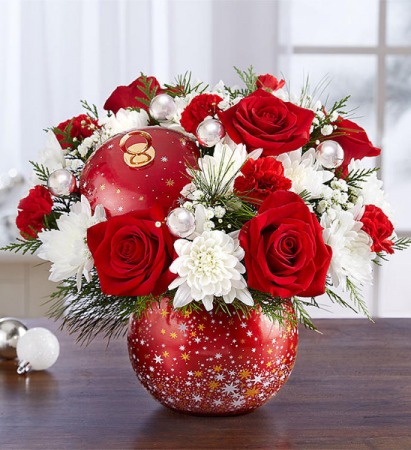 A perfect gift for someone special this winter. 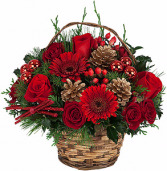 An assortment of red flowers and Christmas decorations in a wooden basket. 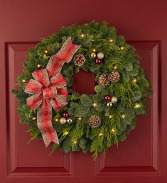 Fresh Christmas wreath with red and gold ornaments, natural pine cones and a pretty red bow. Lights not included.